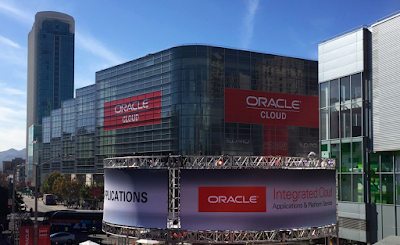 Oracle unveiled a Data Visualization Cloud Service that lets users combine data from a variety of sources -- Oracle and other SaaS applications, on-premises systems, external sources and personal files -- and immediately gain new insights using visual analysis. Oracle Data Visualization Cloud Service provides compatibility and integration with the full breadth of Oracle's analytics offerings. "Oracle Data Visualization Cloud Service makes data visualization 100 percent self-service, empowering business users to go from raw data to actionable business insights in just a few minutes. This new service delivers rich visual analysis, rapid discovery of insights and secure collaboration, enabling fact-based decisions at every level of the organization," stated Hari Sankar, group vice president, Business Analytics, Oracle. IBM is launching a Spark-as-a-Service offering on Bluemix following a successful 13-week Beta program with more than 4,600 developers using it to build intelligent business and consumer apps fueled by data. 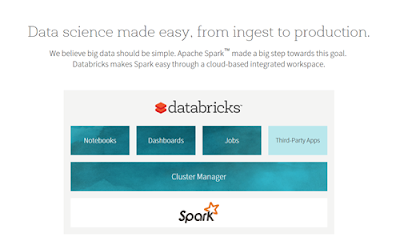 IBM also confirmed that it has redesigned more than 15 of its core analytics and commerce solutions with Apache Spark. 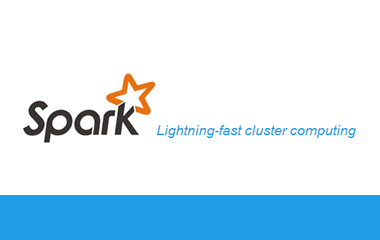 Apache Spark was developed by the AMPLab at UC Berkeley as an open-source cluster computing framework. It offers in-memory processing and is known for its ease of use in creating algorithms that harness insight from complex data. IBM introduced Insight Cloud Services, a service that leverages data from Twitter and The Weather Company, as well as open data sets and business-owned data, to help turn streaming data into insights and change critical business outcomes. IBM said its new cloud-based insight services use analytic models to take the complexity of combining internal and external data. IBM Insight APIs for Developers: Four new APIs that developers can access from IBM Bluemix, IBM's cloud platform, to incorporate historical and forecasted weather data from The Weather Company into web and mobile apps; and two APIs that allow developers to incorporate Twitter content –that is enriched with sentiment insights from IBM –from Decahose or PowerTrack streams into apps. IBM Insight Data Packages for Weather: New bundled data sets from IBM and The Weather Company customized for key industries and available on the IBM Cloud. Built on a variety of weather data feeds that provide everything from real-time alerts for severe weather disasters to seasonal forecasts, the data packages can help insurers use weather data to alert policyholders ahead of hail storms that may cause property damage, help utilities forecast demand and identify likely service outages, help local governments to develop detailed emergency planning in advance of severe weather, and enable many industries such as retail to use data to help optimize their operations, reduce costs and uncover revenue opportunities ahead of changes in weather. IBM Industry Analytics Solutions: A set of pre-built solutions that leverage IBM Insight Cloud Services cognitive techniques to help enable business users to tackle very specific industry challenges. This expands on a set of industry solutions IBM introduced in May 2015 that provide businesses with the ability to generate new types of insights based on customer behavior. 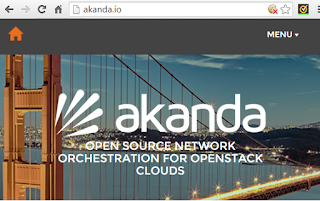 Akanda, a start-up offering an NFV orchestration platform, announced its Astara's Liberty release for Layer 3-7 networking services. The new version, which is now available to OpenStack operators, is the open source network orchestration platform's most substantial since its initial launch, and is Astara's first since becoming an official OpenStack project. More configurability: A new load balancer driver allows OpenStack operators to configure the platform to load and manage only the resources they choose. Current implementations include NGINX and NGINX Plus. Quicker provisioning: Neutron resources are now much more quickly provisioned onto appliance VMs via a new service that manages pools of hot-standby appliance VMs. Cumulus Networks integration: Tight integration and support for Dynamic Lightweight Network Virtualization gives OpenStack operators a complete, OpenStack-ready stack. Higher availability: Active-active high availability and scaling improvements. "Astara's first release as an official OpenStack project is an exciting one for OpenStack operators," said Henrik Rosendahl, CEO, Akanda. "The goal of Astara is to make Networking and DevOps' lives easier. With tremendous community support and momentum for the platform throughout its first year, Astara is the answer for massively simplified OpenStack networking stack that can replace traditional -- and expensive -- single vendor lock-in." Akanda was incubated since 2012 by DreamHost. 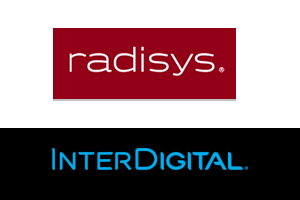 Radisys and InterDigital have demonstrated interoperability between a Radisys end-to-end LTE network, including the CellEngine eNodeB and Evolved Packet Core, with InterDigital’s oneMPOWER Platform. The demo, which is showcased at this week's IoT Korea International Conference in Seoul, Korea, includes 3GPP Release 12 compliant Radisys’ Trillium LTE CNE and CellEngine TOTALeNodeB LTE small cell software with certain feature modifications by InterDigital along with Google Nexus 5 handsets. Since the program’s launch in 2014, Cisco EIR has incubated and collaborated with 17 startups in Silicon Valley and Vienna, Austria. 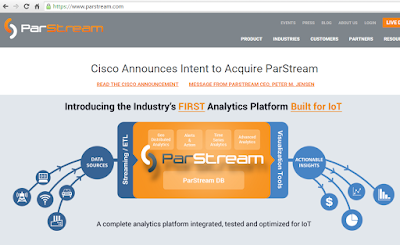 Cisco has agreed to acquire ParStream, a privately-held company based in Cologne, Germany that provides an analytics database that allows companies to analyze large amounts of data and store it in near real time anywhere in the network. Financial terms were not disclosed. 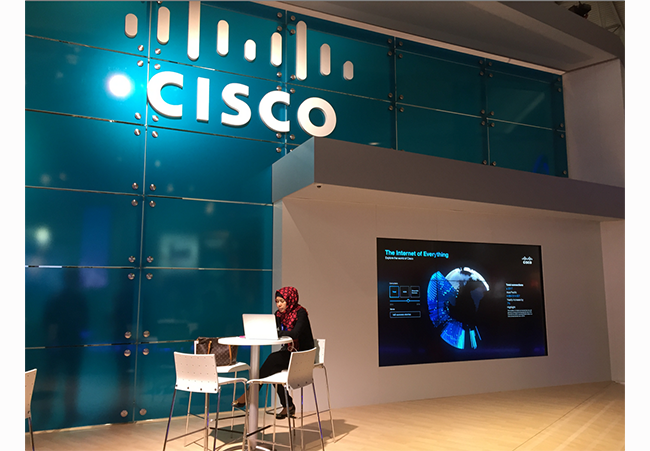 Cisco said ParStream's highly specialized database is especially useful for IoT applications that generate large amounts of data at the edge that needs to be processed in real time, with minimal infrastructure. ParStream uses compression and indexing to help customers access data faster and at scale, rapidly analyzing and filtering billions of records and getting information to the business in near real-time. ParStream will be integrated into Cisco’s Analytics and Automation portfolio. ParStream was part of the Cisco Entrepreneurs in Residence start up program. 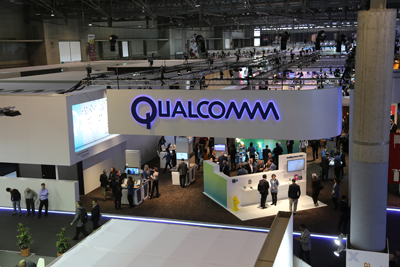 Qualcomm introduced its latest LTE modems (the MDM9207-1 and MDM9206) designed for Internet of Things (IoT) devices. "Qualcomm Technologies continues to expand the capabilities of LTE to accelerate progress in IoT today with the MDM9207-1 and MDM9206," said Anthony Murray, senior vice president and general manager, IoE, Qualcomm Technologies International Ltd. "These modems demonstrate our continued commitment to the expansion of existing LTE commercial device capability in addition to new standards-based Low Power Wide Area (LPWA) technologies that will lead to global cellular solutions with longer range, lower power and lower complexity, such as LTE Cat-M (eMTC) and NB-IOT." 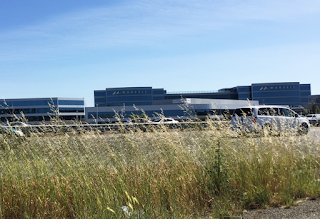 PMC-Sierra reported Q3 2015 revenue of $133.6 million, an increase of 7.1 percent compared to $124.8 million in the second quarter of 2015, and a decrease of 1.4 percent from $135.5 million in the third quarter of 2014. 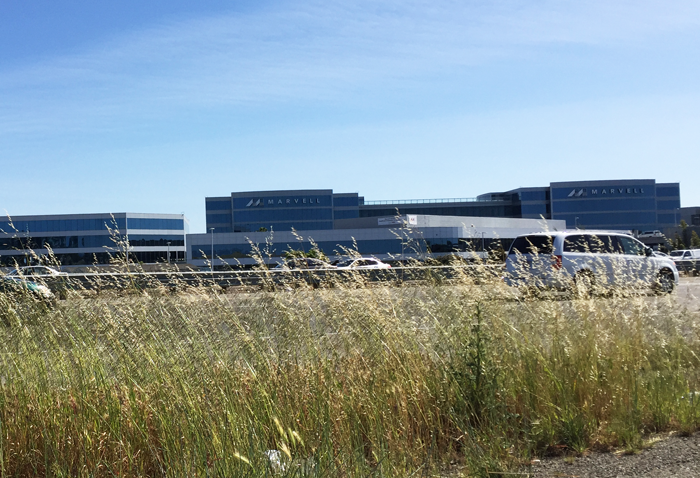 GAAP net income in the third quarter of 2015 totaled $6.7 million or $0.03 per diluted share, compared to GAAP net loss in the second quarter of 2015 of $8.6 million or $0.04 per share, and to GAAP net income in the third quarter of 2014 of $5.5 million or $0.03 per diluted share. GAAP operating margin in the third quarter of 2015 was 8.3 percent, compared to GAAP operating margin in the third quarter of 2014 of 5.5 percent. Storage product revenues reached a quarterly record of $97.6 million, or 73 percent of revenues, an increase of 12 percent compared to storage product revenues of $87.0 million in the second quarter of 2015. Optical product revenues in the third quarter of 2015 totaled $23.5 million, or 18 percent of revenues, a decrease of 7 percent compared to optical product revenues of $25.2 million in the second quarter of 2015. Mobile product revenues in the third quarter of 2015 totaled $12.5 million, or 9 percent of revenues, which was flat compared to mobile product revenues of $12.6 million in the second quarter of 2015. In an SEC filing, Marvell Technology Group announced that PricewaterhouseCoopers has quit as its outside auditor. PricewaterhouseCoopers, had served in that position for the two past fiscal years, resigned on October 20. Marvell noted that PwC advised the company that it would need to expand the scope of the 2016 audit in several areas, including whether senior management’s operating style resulted in an open flow of information and communication to set an appropriate tone for an effective control environment.